Monster Type: Lowlife, Enchanted (Rare). A greater insect swarm is not simply a larger swarm of bugs, but rather a swarm of the nastiest insects that a fantasy world can produce. Like the lesser version, the swarm takes up an area of space 10’ x 10’ x 30’ and anyone caught in the area will take damage. 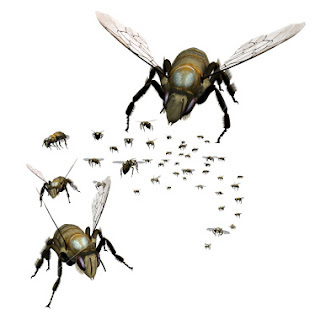 Swatting at the swarm will reduce the damage by half. Weapons are generally ineffective, and spells that target only a single target will do only half damage, but area effect spells do double damage. There are a variety of different types of greater insect swarms, all of which use the above stat block with the following modifiers. Giant Fire Ants: These ants are individually a pest at 3”-5” long, with a burning bite. Together in a swarm their infernal heat sets fire to anything flammable. Anyone in their 10’ x 10’ x 30’ area will take fire damage equal to their hit dice per round, and an additional 1d6 points of bite damage. Swatting them will reduce the bite damage by half. Flesh Eating Scarabs: These flying beetles can strip a cow to the bone under a minute. Anyone in the swarm not wearing a full suit of metal armor will take 2d8 points of damage every round. Those encased in metal armor will take only 1d6 points of damage. Swatting will reduce the damage by half for both. Killer Bees: These bees are only 2" long, but they have the disposition of a pissed off red dragon. Anyone caught in this swarm will take 2d4+3 points of damage every round. In addition the buzzing of the bees creates a Cause Fear effect (as the Cleric spell) to anyone in the swarm. Anyone who fails their saving throw will be unable to take any action but running away from the swarm (including swatting) for 2 turns. Blooderflys: This swarm moves slower than other flying swarms (Flying: 30' (10')). Anyone viewing their crimson, gold, and black wings must make a saving throw vs spells or be entranced by their beauty. Anyone so entranced will take no action as the swarm overtakes them. Once within the area of effect they will be drained of blood 1 hit point per round. Once a creature is reduced to half and then one quarter their hit points they may make additional saving throws. Anyone who passes their saving throw will be immune to the blooderfly swarm's entrancement power for a day. You may have seen this on Saturday, but it wasn't supposed to post till today. Also, there is a new poll! Do you play 40K? Today marks the first in an ongoing series I'm calling "Sunday Inspirational Images" which is really pretty self-explanatory actually. Nevertheless, I do hope you enjoy. It will be worth your time to click through to the full sized version. I found it here. 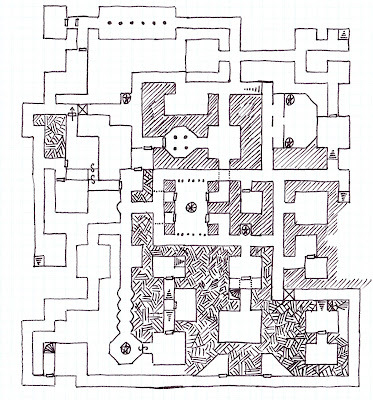 When I first started drawing my dungeon, I was labeling each map as “map #x” which only works up to a point. Now that I’m keying the maps, I need to rethink that nomenclature. At this point I’m working with calling each map by level, and then by section, so 1A, 2A, 2B, 2C, etc. This works a little bit better I think, but none of my maps use that, since that’s not what I was doing when I drew them. I've also noticed that my pencil drawn maps don't really transfer to PDF format very well, even with cranking up the contrast. They're readable, but they lack the charm that the actual maps provide. 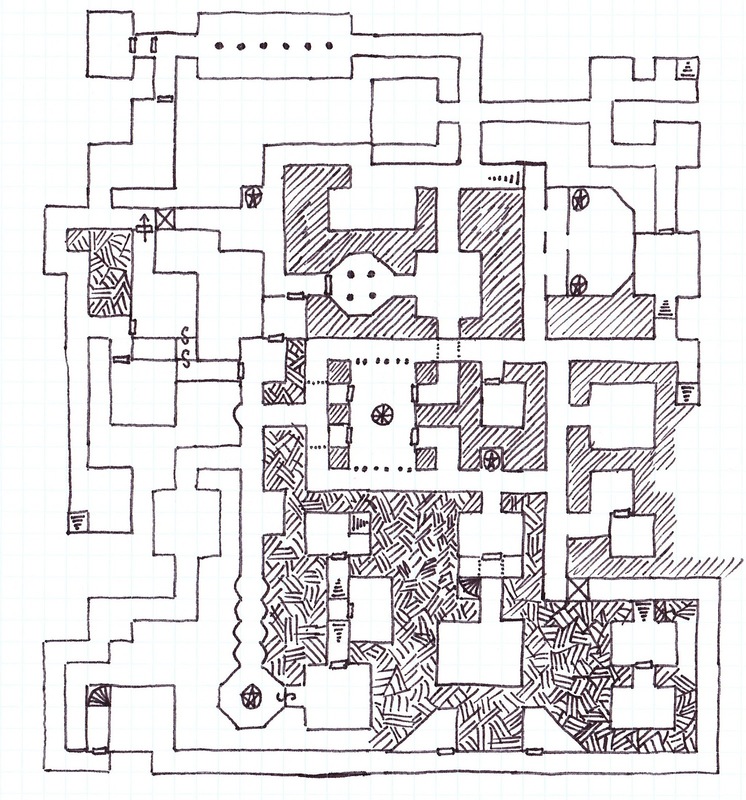 So I'm left to wonder if it would be worth it to redraw all of my maps? I can see a lot of advantages to doing it too. Some of them don't fit very well onto the page, and redrawing them will allow me to fit them onto the pages better. It will also allow me to label them consistently with my new scheme. I'm most comfortable with pencil mapping, so unless I get really comfortable with using pens, my first drafts will continue to be in pencil. What do you think? This is a completely unaltered picture (ok, it was cropped) that was drawn with a felt tip pen on graph paper. It's certainly easier to see on the computer, and even in person. I don't know if I quite have the Dyson Crosshatching™ down quite yet, but I think it's pretty close, and I think it looks better than the diagonal lines I use when I map in pencil. I think I'm going to try using some other pens, and see how they work too. I haven't gotten any feedback on the new PDF's yet, so I'm not sure if anything needs tweaking. I'm running it as an PbP game, but based on their speed so far, it'll be a while till they get to these sections. “How was I supposed to know it was a trap?! ?” Nimble asked as they ran down the corridor. “Because you’re the thief!” Rathgar said back. “Stop arguing, keep running” Allianora yelled. “Hey, shouldn’t we have taken that turn?” Feris asked as they continued down the hall, slowing slightly. The appearance of the swarm of biting, gnashing, chattering insects caused him, and the rest of the group, to speed up. Feris rounded the corner behind everyone else and smacked into Rathgar. After bouncing off, and seeing the dead end, his features hardened. He stepped back around the corner, toward the oncoming swarm, and spoke a few short words of power. The hallway chilled instantly, the walls frosted over, and amidst the swarm a sphere of ice took shape. Many of the bugs died instantly, and others died fleeing the sudden cold. This spell creates an Icy Sphere of Frozen Death, a 3’ sphere that radiates magical cold. The mage may create this spell out to a range of 60’. Anyone standing within 5’ of the Icy Sphere of Frozen Death will take 1d4 points of damage plus 1 per level. For as long as the sphere is in existence, the mage mage roll it up to 10’ per round by concentrating. The sphere has an armor class of 2 and its hit points equal the casting wizards level. If cast within a body of water it will create a sphere of ice in 1 round 10’ in diameter. Anyone caught within that sphere must make a saving throw vs paralysis or become frozen in the sphere. The sphere, and anyone attached will immediately rise to the surface. If cast at the surface of the water, the sphere will create a hemisphere of ice. Either of these effects cause the spell to immediately end, but the ice will remain until it melts. Over at the Savage Sword of Scadgrad there is a fantastic little mini campaign map for the locations around Stonehell. It's the map your crazy uncle made when he was nuts enough to go crawling around in ruins looking for gold and magic. Watch out for the Blood Shield Bandits though. The Alexandrian warns that these guys are not your typical dumb bandits! You'll also want to keep an eye out for the The Undead Guardians of Veroth. Where are they? Maybe deep in Stonehell, maybe just under a farmers field. Either way, don't get caught by them! Lastly, you didn't hear this from me, but I heard from Bat that Virania is actually ruled by a Horror Worm! Isn't it amazing how you can put together an entire campaign from just a couple of posts? I was pondering the discussion going around about the use of hirelings, and how some groups never use them even when they could. Some players just don't really consider them. Others have dealt with jerk DMs who make every other NPC a doppelganger/evil cultist/etc. and so the players live in perpetual fear of everyone. I don't know what to suggest for those poor souls except finding them a new DM and a healthy group in which to unlearn the terrible things the jerk did to them. However, the players that just don't really consider it? I may have a solution. Morwin held out his hand expectantly. “I wouldn’t miss it for the world.” Morwin replied as he hefted Feris’ pack. Happy 300th Post & Megadungeon PDF! This post marks a big anniversary for The Tower of the Archmage, and because of that, I wanted to give all of you a gift on this occasion. Level 2A AND Level 2B of my megadungeon! These are draft versions, so please let me know if you find anything wonky. Oh, and for the moment it's being called the Ruins of Zeteh Zandana! Excerpts from the journal of Rathdal the Dwarf, son of Brann of the Bronzebeard Clan, and now known as Rathdal the Outcast. "Father says that I'm an upside down dwarf. Not interested enough in gems and metals, rock and dirt. Maybe he's right." "It's even more beautiful than the books could describe. The light sparkles over the water like it does through jewels, but here there are an infinite number to dazzle the eyes." "The mate said they'd never had a dwarf on board, but that he thought that he could make a sailor of me." "I just can't get up the ropes fast enough! I've been sent below to help the cook. The mate said 'If we need someone to swing an ax we'll call. Until then, stay out of the way.' How am I supposed to be a sailor if I'm stuck with the cook?" "We attacked a cargo ship today. I wasn't much help till we came along side and began to board, but once we did, I was practically unstoppable! They gave me a big shield and just had me push through. After that I just helped them knock some heads together, tie them up, and we were done with almost no losses! We did lose the cook though. Since I've been mostly banished below deck anyway, the mate assigned me as new cook. 'Until I kill someone with my cuisine.' was how he put it." "Turns out I'm pretty handy with a ladle. Who'd have thought I'd go to sea to become a cook?!?" "The mate had to skip the action today. He was down with a bad stomach bug, but I'm taking the blame. The rest of the crew didn't seem to mind dinner last night." "He put me ashore! Told me that no dwarf would show him up in front of the crew, and now here I am. Where ever here is. I don't even know if this Atoll has a name." "I wonder if they'll ever come back for me." "I'm running out of water. It hasn't rained in days." "I saw a ship today, far out on the water. It never came near. There was a brief squall, I collected as much water as I could. I hope it's enough." "It's been a week now, and I'm out of water." "I think an empty coconut just talked to me. Really need some water." "The coconut says it's name is U'slim. What an upside down name. It told me to dig up a shell from under a double palm tree. I brought it 3 before it said I found the right one. It told me to scoop up some water and drink from it. The only water left is from the sea. You don't drink sea water." "It took another day, but I listened to it. I drank from the seashell, and it was pure freshwater!" "U'slim says that it isn't actually a coconut, but the Atoll itself. That U'slim is really a god..."
"U'slim told me where the crabs hide today." "A ship stopped here today, offered to take me with them. Where could they take me, but away from U'slim." Rathdal still lives on the Atoll of U'slim. I doubt that there are many of you that don't already read most if not all of these blogs, but I just have to share. Dyson, maker of maps extraordinaire, has created some basic D&D prestige classes. The basic rules are here, and then you can check out the Dark Assassin, Hierophant, Justicar, and the Stonelords. I also get the feeling that he isn't done, so keep checking back! The Blog of Holding has a great idea for higher level characters who may take advantage of some honest pirates, and how it may come back to bite them. Jeff's Gameblog wants to show you what gems look like in a variety of denominations. So far he's got 1,000gp, 500gp, and 100gp. The ever fascinating Alexandrian spent some time talking about re-running a megadungeon. He continued this with a post on factions in the dungeon (B2 specifically), and earlier this week talked about goals in the megadungeon. It isn't all about clearing the dungeon! The Paladin in Citadel's post from Tuesday about the Displacer Beast as a megadungeon villian fits into that amazingly well. Finally over at Hack & Slash is a handy 30 page PDF that shows you want to do with all of those empty rooms in your megadungeon. The timing of this couldn't be better as I'm neck deep into working on level 2 of my own megadungeon! I have high hopes for this. It has been many months since dice were rolled in actual game play at my table, but today my cousins are coming down to finish the Keep on the Shadowfell. I've written before about prepping for my game, and it's much the same this time around. One of the big differences is that aside from doing a bit of looking at the Monster Vault, I haven't really thought about 4e much lately. Mostly this is because I've been working on my megadungeon, running my megadungeon in a PbP game, and playing in Chicagowiz's OD&D modern PbP game. So I know that for both myself and my players it'll probably be a bit rough going as we all readjust our brains to 4e rules. As before I've re-read KotS, re-read my previous posts about it too. I've also prepped those printable DM encounter sheets, as they were extremely useful last time! The miniatures have been presorted, and the battlemat is unrolled. I'm going to keep notes on the game as we play, and as soon as I can I will write up a session report, as well as my thoughts on KotS and running 4e. It won't be immediate, as I have a midterm that I need to wrap up on Sunday. I swear to you, there is a door here. How many dead ends have we seen here so far? None. What makes you think this is the first? Look, lets just see if we can't find a catch and open it up. There wasn't much to hear for a couple of moments, and then the sound of stone grinding on stone as the wall opened up, revealing the four figures looking anxious. The smallest of them slowly moved into the room, looking everywhere, but keeping at least one eye on the statue at all times. As he approached it, the statue spoke. "Seek ye the treasures of Kal'Ra? Than put your coin under my press and receive..."
This device is designed to turn coins into art objects. When coins are placed upon the octagonal stone, the elephant raises up the press stone, and smashes it down upon the coins. Consult the tables below for the results. For every additional coin used, add 1 to the roll, up to +6. For every result above 12, roll twice. “Come on, keep up! We can’t lose them now!” the man in the white robes and turban commanded to the soldiers in black and purple. Ahead of him people bustled about, the market was in full swing, in spite of the late afternoon heat. “Mizra Cal, we’ve been following you around the city all day. The men are hot and tired. Can we not rest a few moments and drink some kaba juice?” asked one of the soldiers. “No! They must be here in the market, we continue.” Leading with his cane, the white robed man strode further into the throng of people. Most people kept out of the Mizra’s way, though a few needed a quick thrash from the cane to speed them on their way. Stopping next to a spice stall, Mizra hesitated. All afternoon he had strode with purpose throughout the city, never showing a moment of hesitancy, until now. 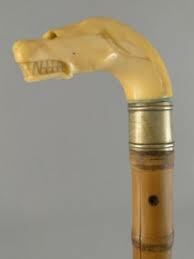 The Hound’s Head Cane is a bamboo cane with a handle of bone, carved into the shape of a snarling dog. It is clearly of fine craftsmanship, although it is beginning to show signs of aging. This magical cane has a number of uses. If set upright it will serve as a (stationary) watchdog for up to 12 hours a day. Anyone who is deemed an intruder will trigger a cacophony of barking which will alert all able to hear it. The sound of the barking will seem to come from all around, and will not be traceable back to the cane. The other power the cane possesses is that it can track by scent, just as well as a hound dog. The bearer of the cane need only command it to follow a given scent. The scent must be presented in a completely unambiguous way (a sock from the person to be tracked for instance). The bearer will feel a tugging in the direction of the scent. Strong scents, such as that of a skunk, will defeat the cane’s ability to track. You find yourself somewhat inconveniently stranded on a desert island. Drifting up onto the beach with you are two crates. One contains the bare necessary equipment to make a shelter and find food. The other contains just four books. One is the Complete Works of Shakespeare. Because there’s always a Complete Works of Shakespeare, that’s why. Two are role-playing books of some kind along with dice, paper, etc. But no internet access, laptop or iPad. Sorry. The last book would be De Bellis Antiquitatis, probably the best (not to mention most fun) wargames rules around. The rules themselves take up just 16 pages and the rest of the book provides historically accurate (or at least, historically accurate enough) army lists and campaign setups from 3,000BC to 1500AD. It’s easy to play solo too, so I won’t need to teach a passing dolphin how to wargame. Give me the DBA rules and enough palm trees to carve myself a few armies and I’ll never want to leave that desert island. When I’m not pushing armies around I can create domains, dungeons and adventures in Classic D&D, or invent superheroes and villains (or explore any other genre, for that matter) in M&M. I’m totally with you on the Rules Cyclopedia for my first choice. The second book would be West End Games’ Star Wars 2nd Edition Revised core book. The third would be The Hordes of the Things miniature game rules, which are based on the De Bellis Antiquitatis system. Being stuck on a desert island, I’m less inclined to care about historical accuracy. About a month ago I wrote that I received the Essentials Rules Cyclopedia Compendium and Monster Vault. Well, Friday night I finally opened up the Monster Vault. I have to say, I'm very impressed. The monster tokens are nice quality, and on thicker stock than I expected. It also comes with an adventure, which I haven't read yet, but I did notice from the map on the back that it uses dungeon tiles (not included) and a double sided poster map (included). I really can't fault WotC for cross marketing their products. There is a reason they made this the essential line. The monster book itself is a digest sized 360 page book with a good variety of creatures across what seems like all levels, though there is a lot of focus on Heroic to Paragon level with only 17 monsters from level 20-27. Again, this makes sense since most players will be playing in the lower level range in most campaigns. I haven't had a chance to compare the stats for repeated monsters from MM1, but I have already noticed some minor differences. I like that they have assigned minions to the various roles. There is one thing that MM1 did that I really liked that the MV doesn't do - suggested encounters. MM1 listed creatures not only in the same category (i.e. not just goblins) but a variety of creatures that work well together, and make (mostly) sense that they would be encountered together. I do find myself worrying about the integrity of the book at the table. The entire Essentials line is digest size, but thick. I bet when they're broken in that they lay on the table really well, but will they hold up to extensive use? Stalking silently down the stone corridor, the hunter sniffed for his prey, the stench of rot drawing him onward. He snuck up on them, his hooves making only the barest of noise as he approached the chamber of murals. Even from here he could see the gore smearing the once beautiful pastoral images. In the center of the room the body of a snakeman was spread, broken, ripped open. Organs, fluids, flesh and bone had all been torn from the body, and feasting upon it were 8 sickly figures. Pale, emaciated, dressed in rags, their fingers and faces stained with blood, and a malevolent intelligence burning behind their red eyes. The hunter knelt down upon one knee and said a brief prayer for the fallen soul before snorting once, and charging toward the abominations. Their reactions were predictably fast, yet one was still impaled upon the hunter’s horns. The rest of them fell back away from the sudden interruption hissing. Flinging the body to the side, the hunter shifted to the right, lashing out with his ax, striking deep into another’s chest. The creatures rallied, and leapt toward the hunter. Two more were dropped before they managed a solid hit upon him, causing his body to freeze. 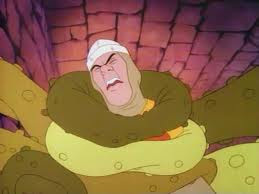 His nose flared before the paralysis took hold, and he silently invoked the power of the amulet he wore around his neck. Pain seared him as his own life’s energy was drawn in to fuel the magic. There was a blood red flash of light. The remaining creatures screamed as their bodies disintegrated. The hunter lay on his back, pleased to have destroyed more of his enemy, and hoping that no others would come upon him while he was trapped within his own body. 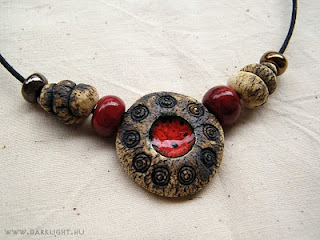 The Red Talisman, created by the mage known only as Dark Mask appears to be a simple necklace made with bone and stone beads. The central bead is a disk with a depressed center, which is filled with a glossy red substance. Around the depression are nine swirls carved into the bead. The wearer of the Red Talisman may voluntarily sacrifice at least 1hp to activate the item. Once activated it allows the wearer to turn undead as a cleric. The user of the Red Talisman may opt to control the undead, rather than turn them. The number of hit points spent +1 equals the level of turning ability gained. Only one person per day may use the item, but that individual may use it as often as they have hit points to sacrifice. Feris turned in time only to see a small creature drop from above, it's long fingers wrapping around his head, its claws grasping the front of Feris' tunic. Its giant eye looked deep into Feris' and as he opened his mouth to scream, the creature's tail filled his mouth. A sharp spike of pain and everything went silvery white. Feris blinked, and found himself standing on a barren rocky surface in a gray void. Faint silvery threads crisscrossed out in the distance. "Where am I?" His voice sounded dull and flat in his own ears. A tugging pain, as if someone was wrenching his hair back caused him to stumble and fall back. When he opened his eyes again Rathgar was standing over him, lifting the headless body from his chest. This creature is the creation of an ancient race, a biological tool that they used to help them explore the astral plane. Unfortunately they don’t interact as well with other races. When they encounter humans and demihumans they will attempt to initiate an astral transfer. This process is initiated by the Optivor thrusting its tail into the target’s mouth. This injects a paralytic drug into the target, and the target must make a save vs Paralysis or become immobilized for 1d6 hours. The Optivor will then lock its single eye with the target. The target must make another saving throw or be sent to the astral plane. If forced into combat it will attack with its claws until it can flee. It isn't keyed yet, but here is my map for the Sea of O'sr. The only inhabitant is a marooned dwarf named Rathdal The Outcast. Clearly he has survived, prospered even, as the hut and the canoe indicate. The sun baked landscape was spotted with yellow grasses and large broken boulders. Every step taken crunched beneath their feet, and the air was alive with the sounds of the wind and buzzing insects. ‘Well, what do we have here?” the voice asked from atop one of the larger stones. Rathgar twisted around, and quickly trained the crossbow on the source of the voice. Perched upon a large rock sat a wingless gryphon, golden and black feathers forming a mane that framed its beaked head. Its muscles were tense in spite of its lazy pose. “We’re just passing through” Alianora said. “Don’t press us beast! You-” Rathgar stopped as Allianora put her hand upon his arm. “We’re kind of in a hurry” Feris said nervously. 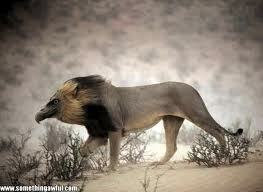 A Keythong has the head and claws of a raptor (usually an eagle), and the body of a lion. Unlike a gryphon, the Keythong is wingless, but far more intelligent. They are known to wear specially fashioned plates of armor reducing their AC to 2 (1 in 8 chance). Others have been known to become spell casters (wokan 6). Load: 3,500 cn at full speed, or 7,000 cn at half speed. Monthly Audience Patricipation Results for February! The votes are in! For a while the Witch Character Class was neck in neck with Megadungeon Topics, when a late surge brought New Locations up from the back. In the end, Welleran's Megadungeon Topics managed to hold onto the lead. By the end of the month you should have a new keyed megadungeon section, in the same 2 page format as my first section, as well as some commentary on stocking it. For those who were hoping for one of the other topics, all is not lost! I've been thinking about each and every one of them, and jotting down ideas. I probably won't be able to get to them this month, but that doesn't mean they aren't coming! And if you really want to make sure I get to it, suggest and vote for it next Monthly Audience Participation round! "What's that?" Nimble whispers, trying to look past the torchlight down the dark corridor. As quietly as possible Nimble notches an arrow on his shortbow, and begins to draw it back. His companions likewise prepare for whatever is coming toward them. 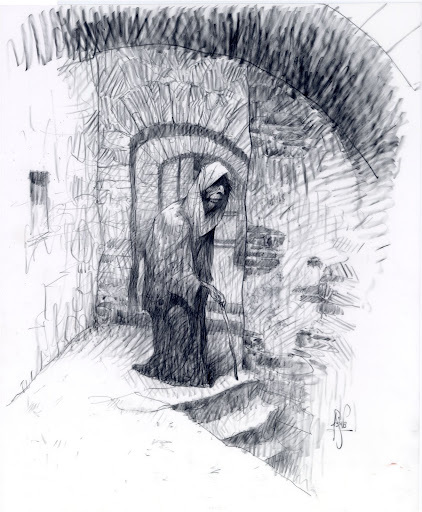 Slowly a hunched cloaked figure pulls itself around the corner and into the torchlight. Supporting itself on a cane is moves slowly toward the adventurers. "You don't want to go this way" a paper thin voice rasped. “And why not?” Nimble asked. “Not a friend. Come.” A bony hand emerges from beneath the cloak and presses against a stone, causing a hidden door to swing open. “Come” the thin voice says again as it steps into the darkness. An age ago, the being known only as the Old Man of the Dungeon became trapped deep in the depths, injured and alone. Something happened to him, and he did not die. Time passed, and he moved about, exploring, keeping to himself. There are few secrets he hasn’t come to discover in the depths and fewer still that he is willing to share. Yet occasionally for reasons unknown, he helps out in small ways those who are not confined to the depths, and asks nothing in return. This assistance may be as simple as a warning, or as elaborate as taking them to a safer area. The Old Man will never point out specific lairs or unguarded treasures, though he knows where they are. He will never be found when sought after, only appearing when he chooses to. The truth is that the Old Man is just one of many aspects of the dungeon’s original creator. None of the creatures of the dungeon even view this aspect. Should you need stats, use a normal human with a single hit point. If he is ever killed by players, they will be left with an old and dirty cloak and a brittle walking stick, and will never encounter him again. The Old Man of the Dungeon serves a variety of purposes in my Megadungeon. It allows me to give the dungeon a voice, and it gives me the option of pointing the players in a different direction. Whether they go in that direction is up to them, and whether I’ll ever use him for that reason, I don’t know yet. We’ll see! I have disabled anonymous comments. As much as I love getting comments (and I do) I always feel like anonymous comments are cowardly. I never use the anonymous option even when it's given. If I am going to take the time and effort to leave a comment, I'm going to put my name to it, I'm going to own it. I have to insist that while you're here, you do the same. Monthly Audience Participation voting update! With 1 day to go, Megadungeon Topics is in the lead, but just a couple of votes could dislodge it from the top spot. Corgis remains in last place with a single vote. I have not told my dogs this. If you haven't voted already there is still time! Carter Soles over at the Lands of Ara has collected various postings on Megadungeon Philosophy. He even included a quote from me! There has been a bit of discussion about an OSR Adventure Path. 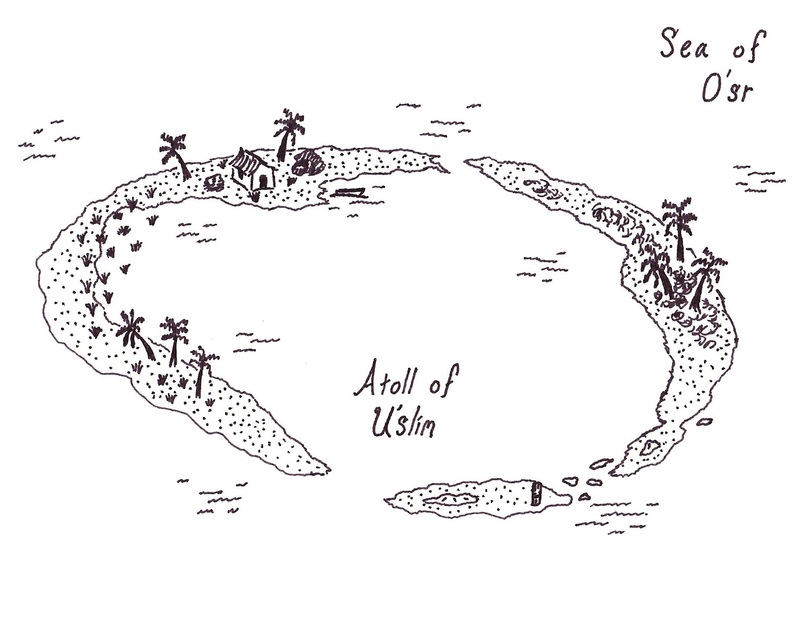 Over at Planet Algol an island archipelago treasure hunt is being considered. It sounds really more of a setting than an adventure path, but then I haven't really noticed any real original settings coming out of the OSR either, plus I think an island hopping treasure hunt, along the lines of the old Sinbad movies would work out really well for just that sort of thing. Sword and Shield shares Theories of International Politics and Zombies! Rathgar, Nimble, Allianora, and Feris rushed into the room, and slammed the door shut, bracing it with their bodies. "Any ideas?" Nimble asked as the door was slammed into from the other side. Feris took a moment to look at the room they just entered. Luckily it wasn't full of more of those damn orcs. There was, however, a well in the otherwise empty room. The banging stopped. "What do you think they're doing?" Rathgar whispered. Everyone was still, trying to hear what the orcs were up to. In the silence of the room they heard a single noise - the clicking of the lock. "Did they just lock us in?" Feris asked incredulously. "Why not, they can always come and get us later." Nimble grumbled. "Uh guys?" Allianora pointed at the well. A tentacle was reaching up over the lip of the well, and stretching out toward the door. The Thing in the Well is a large tentacled monster that lives in narrow spaces, attacking and eating those that stray within it's reach. It is both a combination terrain piece/monster/trap - a tentacled monster that has rooted itself in a well. While the players can temporarily disable it, it is nearly impossible to kill. Luckily for anyone encountering it, it's rooted in place, and as long as they avoid getting too close to it, they should be fine. I'm picturing the Sarlacc from Star Wars in the middle of a dungeon. Maybe a little smaller. Potentially it could be living in a space between 2 sections of a dungeon, and the only way to get to that section is through the beast. What could be in the long closed off sub-level? The Burning Sands is an expanse of sun bleached desert that hides the entirety of the fallen Empire of of Kal'Ra. In the last age the Empire was at war with other worldly beings, and they lost. The empire collapsed, and the desert sands covered it in a day. 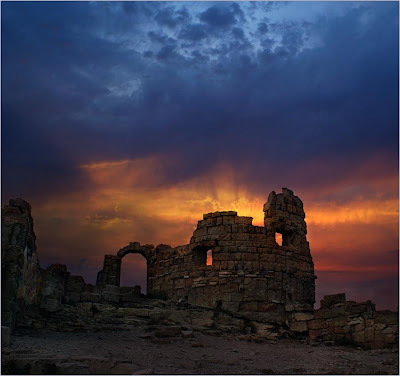 Fabulous wealth, treasures beyond imagining, and weapons unseen in a millennium yet reside in the great cities and castles of the Empire, which occasionally are revealed by the shifting winds of the Burning Sands. The Magus Zabaan crisscrosses the Burning Sands. He has no tower that he calls home. Rather he was known to stop at a variety of villages that ring the Burning Sands as he searches for ancient magics. Throughout his travels has had a number of companions, many of whom have continued on to have fame and wealth apart from Zabaan. The last and most famous of these companions is Sita Hatun Sultana, a talented and beautiful young woman who spent many years with Zabaan. On their last mission together, Sultana was retrieving a tome of mystical knowledge from a Kal'Ra ruin, when the spirit of the book tried to take control of her. In the ensuing conflict Sultana' lost her arm, and spent many months recovering. Zabaan spent that time creating for her the Vrachíona, and as soon as it was finished, he left her and the remaining companions, and headed out into the desert alone. He has not been seen in many years, and while some believe that his bones have long since been stripped by the sand and by the sun, Sultana and the rest of his former companions speak with one voice of Zabaan's continued exploration of the ruins of Kal'Ra. If he still lives, Zabaan is a wizard of great power, and little interest in the goings on of the world. I managed to post a record (for me) 32 entries in January! I'm not exactly sure how I managed that, but I don't think I'm going to match it in February. For one thing, there are fewer days. For another Grad School is back, and I really need to devote my attention to it. So expect a bit of a slow down. I just wanted to give you a heads up. Oh, and don't forget to vote in the poll on the right! It seems my submission to Grognardia's Petty Gods didn't make the cut. I'm not too surprised, as the level of talent out in the OSR is pretty amazing. However, I did enjoy coming up with this god, and so I've decided to share him here. If he sounds familiar, it's because I posted about some of his followers earlier. Dazmig was said to be a wandering warlord who burned with an unending anger before taking his place among the immortals. Famous for his predawn attacks, he would raze sleepy cities to the ground before the sun fully crested the horizon. Once he attained immortality, he claimed those who suffered from Unending Anger as his charges. He appears as a spear wielding warrior in chain. His symbol is woven into the armor with colored links as well as adorning the crest of his helm. The Red Dawn fights as a level 22 fighter, and can also cast clerical spells as a level 10 cleric. He also may enrage anyone who he chooses unless a Saving Throw vs Spells is made. Should the target fail their saving throw they will suffer a -2 penalty to their armor class, saving throws, and attack rolls, and they will gain a +4 to all damage on all successful attacks. The effect lasts for 24 hours. You have interested Dazmig! Do not spoil this opportunity! Dazmig is willing to listen, but you had best make it worth his time. Turning his eyes upon you, you can feel Dazmig’s displeasure. You have approximately 10 seconds before Dazmig spites you. Think you can face a god in combat? Good luck with that.